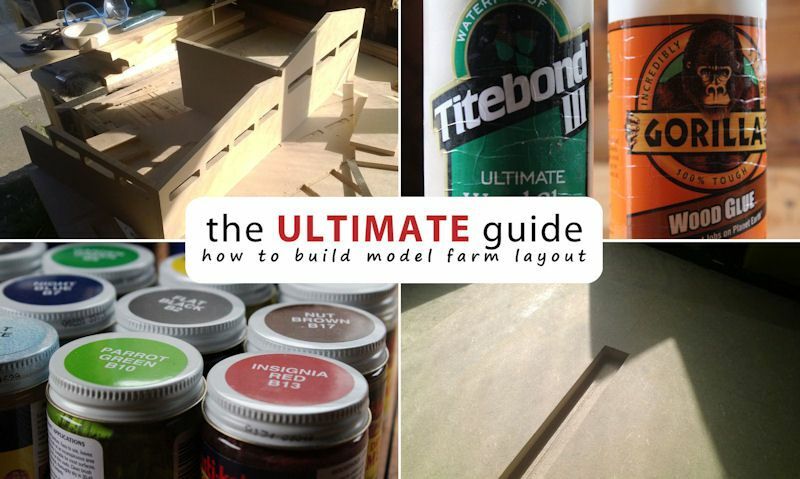 Here's our ultimate guide to making a wooden toy farm set and layout, built from scratch to finished project, made in scale specifically to the model brand of your choice. Well we don't have any direct project plans for you at this time, all this information gives you an in-depth look on the planning side, from start to finish by knowing what you're going to make. To sourcing timber, what tools are needed, adhesives, assembling and painting. If you seek advice not mentioned this article, you only need to prefer to commercially available toy farm sets that might inspire you in both design and building technique. This how-to is an updated edition from our how to make toy farm article we wrote way back in 2008, a small post but in much less detail of this latest write up. We do hope to provide you detailed woodworking plans in the near future, in the mean time us this how to make a toy farm guide to get up started, well you'll need to create your own plans. We drew up our plans using a simple photo editing software, but you can still make your plans by hand with big sheets of paper.You can then work out how much wood you need and make notes of all measurements. Before you do anything else, you need to know what are you going to build. This planning begins with your child's toy farm brand of choice. Its only then you'll get an idea how big it is and how much storage space you'll need - so you'll have a much clearer picture. But don't worry yourself about scaling, all you need to worry about is the farm set gates and doorways are wide enough for people and tractors to pass through, with your buildings for holding tractors or accessories, fit the toys you should have to hand. To make a success of your project, it's a good idea to always have a number of children's toys available to use a as reference. This way everything will fit once assembled with wide enough gates and buildings your can park a toy tractor under. Any wooden toy farm set needed in 1:32 scale, available from the Britains and Siku range, the baseboard dimensions should be no more than 60cm x 60cm. On this base board will go the parameter walls, farm buildings and general farm layout. As the scale begins to get larger - double in size - so does the need to expand your farm set layout, so you can think about a baseboard in 60cm depth to 100cm width. Better still, why not build two 60cm x 60cm baseboards to make one big farm set by either joining the boards with hinges, or better still keep them as separate parts for easy storage. I'm afraid due to the sheer size of 1:16 scale, it would not be feasible to build a model farm layout for toys in this scale - for some maybe, but it won't be an option for most. If you need to, look at sheet material with a baseboard starting at 4ft by 4ft, and consider building the farm baseboard in two for easy storage and transportation. Simply look to well know timber merchants in your town and city, but you must start with your local Jewsons, if you're in the UK. Jewsons are a major timber supplier, and well they may not have the specific wood you need in store, they just may be able to source it for you from their other stores close by. They will go through the trouble of bringing it in specially - though you'll have to wait. Generally speaking MDF is a good choice, not only it cheap, but different size boards and thickness is a big plus. 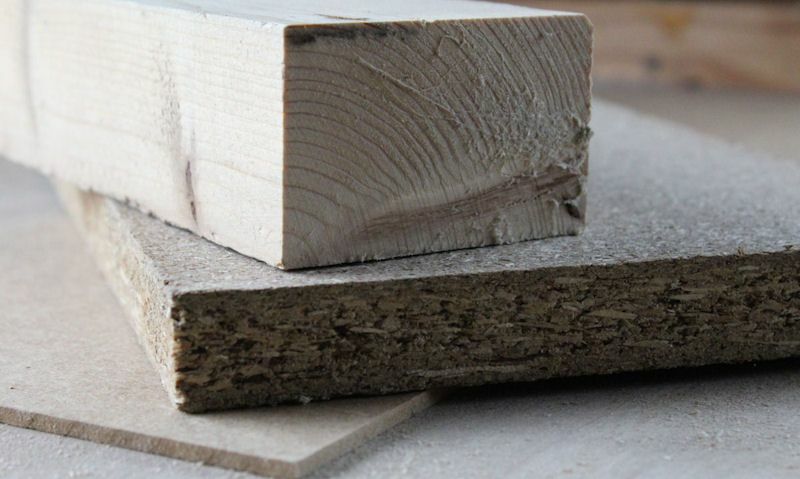 Similarly, if you're using plywood you get the same benefits as MDF, only ply gives a natural grain finish. When it comes to building affordable wooden toy farm sets, look no further than standard MDF, 12mm thick is good, but a 18mm thickness works better so it can take more glue and 6mm wood dowels should be enough to prevent any accidental corner splitting. Try to avoid run of the mill MDF, so ask about a brand called Norbord Caberwood Pro, quality strong bond MDF that will hold glue, dowels and screws with ease, with a smooth unblemished surface to work with. 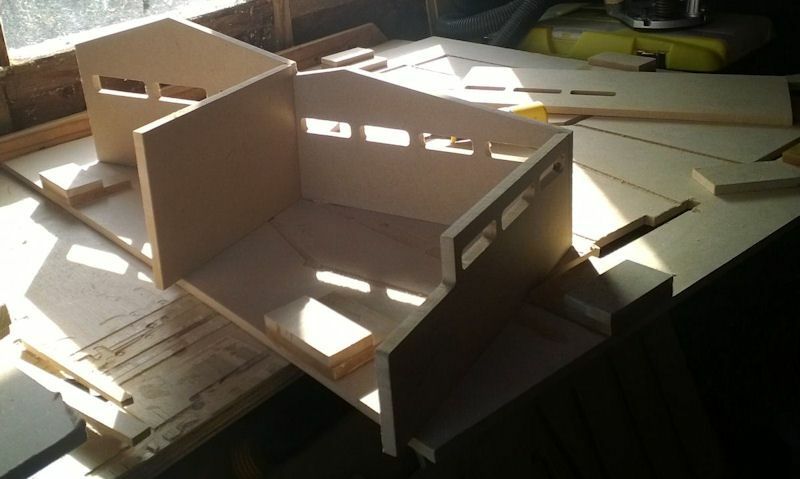 When building farm sets using MDF, you'll make the plans for your project by knowing you'll be ripping the wood in strips, and then cross-cutting it down to get all the parts you need. And MDF is perfect for this, but you could save money by only asking the merchant for the amount of sheet material you need - 4ft by 4ft should be enough in 12 or 18mm thickness. If your happy for your farmyard baseboard to be this thick then your sorted, but I like to use 6mm thick MDF for both the baseboard and roofing of the various farm building. When going for plywood you can rest assured this material will give you a lovely finish when choosing a birch face, others like marine does not look so nice and is only really used in the construction side of things - not toy making. But plywood over MDF has huge benefits, ply dust is a little safer, it's lighter and paint isn't required as the birch ply face looks perfect as is - but perhaps a coating of stain or wax would help protect the wood. As pine often comes in various small widths and up to 8 feet long, you'll going to need to get it down to the minimum length you need, before using a band saw or planer to get the planks cut down to the same thickness. Ordering pine online or picking it up yourself from the DIY store doesn't always mean you'll receive straight, unwarped wood, and pine is a real culprit with this, so that's why a thickness planer may be needed - all else you could be left with unusable wood supplies. You may find pine planks under the name whitewood, similarly but not the same is redwood - also cut in short widths and long lengths. All natural woods are not only beautiful, but easy to work with, so if you wish to create a farm set with a natural wood grain finish, then Oak, Beech, Maple and Birch will do. But bare in mind these are expensive woods and a mistake could be costly, and to be quite honest may be more suitable for making furniture then children's toys. Although you may want to think about making an Oak toy chest. Absolutely stay away from poor, standard MDF as the glue and dowel joints won't hold under rigorous or gentle child's play - so stick with quality MDF boards. Likewise stay clear of chipboard as it offers nothing in joint strength and will peal apart with ease. Generally, you should only stick with the wood we recommend above. Our Makita circular well a good tool, it's actually a little big and heavy and would prefer a saw that is smaller. But still it does have a professional class, so should last the test of time. To be perfectly clear, to build a successful wooden toy farm project, you do need power tools suited for ripping and cutting. Cutting by hand can be tiresome for amateurs, well power tools makes the cut with little fuss. Before buying your material and logging it home, check out timber merchants who provide an in-house cutting service. If you have your ripping dimensions ready, they just might do it for you if they have time. 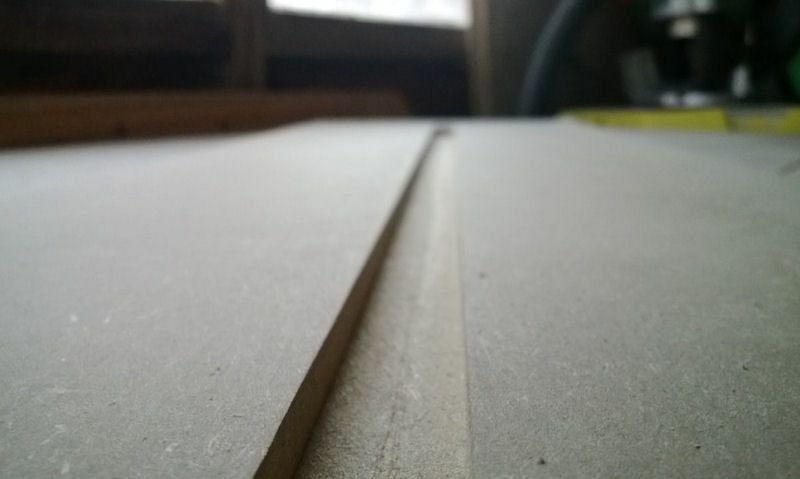 However, if you have to do it yourself when cutting down sheet material like ply and MDF, you need to run these big sheets through a table saw or use an handheld circular saw to cut strips - which we recommend. 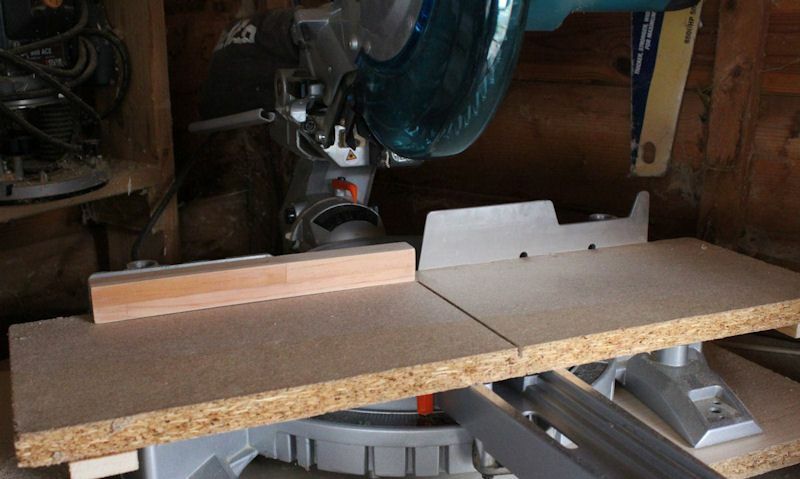 To rip natural wood like pine or oak planks, you'll going to need a band saw, before running it through a planer. Natural wood often comes in long strips, so its difficult to cut, whereas sheet materials allows room for clamping down. If you choose to use hand tools, then you are probably an expert in the field so you won't need our advice, but we should say to beginners; a tenon saw, chisel and a planer are among the most import hand tools needed. When using power tools be sure to make the most of your dust extraction port on the tool, fixed to an dust extractor. 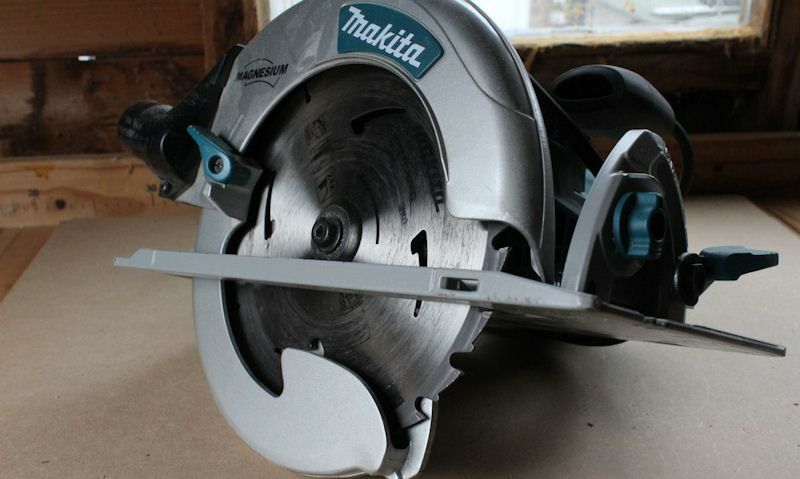 Our Makita circular well a good tool, its actually a little big and heavy and would prefer a saw that is smaller. But still it does have a professional class, so should last the test of time. 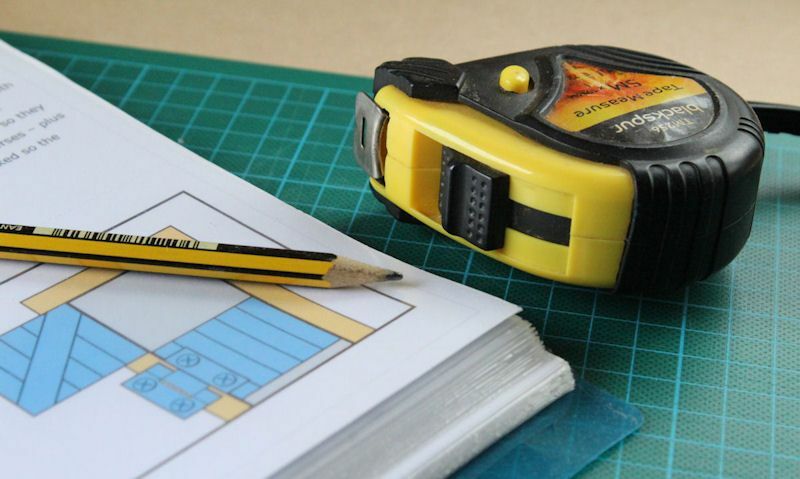 Well using power tools like mitre saws and circular saws should be a quick and simple solution, you'll find during the cutting stages that your tool is missing something and unable to perform a task for you - and this is aways an unexpected restriction. To overcome this, you'll need to make a template or jig for any of your power tools to make cuts accurate and easier, or to hold wood parts down as you router. For example, we created a template for our circular saw to sit on when ripping sheet material, slotting into dowel holes for us to cut strips certain widths. This is an ideal way to cut multiple strips of the same widths. If you look carefully we don't cut all the way, but this circular saw template serves to produce more accurate 45 degree cuts, well the wood for cutting is more stable because the Makita saw without this template has a large gap that traps cut-offs - and that's awkward. Then for our Makita mitre saw (pictured above) we made a template that sits tightly onto the cutting area so we can make cuts more accurate than the mitre saw produces itself. When in the shed the disposable dusk mask is always on as dusk always remains in the air, and so does the safety glasses. The ear protectors come off when not in use as they can be uncomfortable, but we only use the gloves when handling timber to avoid splinters. We can't stress enough that you absolutely must use ear protectors and a fine dust mask at all times, even when you are not cutting for the latter. 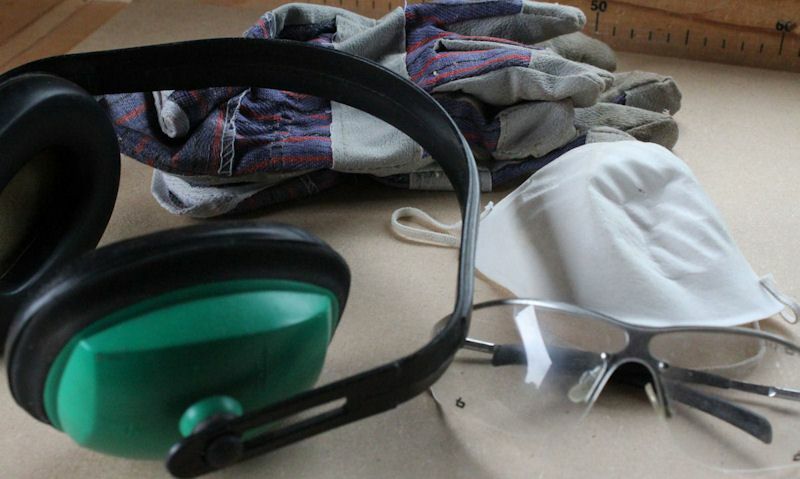 You must get in the habit of wearing a face mask and ear protection at all times when you enter your shed or workshop. You don't have to wear goggles at all times, but again whether your cutting timber by hand or using power tools, you absolutely must use your safety goggles. More importantly, at this stage of using power tools, especially when cutting down MDF, please do not allow children of any age in the workshop to protect their little lungs now, and preventing the possibility of health issues developing later in life. Save it until it's assembling, gluing and painting time before the kids join in the fun, you could also bring it all into the house at this point. By this we mean a table saw or circular saw used to cut strips - known as ripping - from the sheet material like MDF and ply. Well a mitre saw is then used to cut down those ripped strips into small pieces. These pieces are roofs, front, sides, and back of buildings and parameter walls and gates - basically all the pieces needed to build your wooden farm set with buildings. Excellent wood glues that are both child-safe when hardened, and produces exceptional wood bind. Stop the glues from drying out by using a pop up cap, but on the down side you sometimes have to remove them to clean the in side. You absolutely need child safe, non-toxic wood glue for your project, so leave your standard wood glue alone and go out a get a bottle of toy safe adhesive. These glues are not safe for children when wet, but when dry they adhere to EU toy safety standards. The glue brands we mention below are both very good glues to use and we personally recommend both, well one dries clear and the other brown, when both produce unwanted glue squeeze through, patches can be washed up with water with ease when still wet. Titebond was the first glue was started using, and regardless of it's pros and cons, you should no it still provides a powerful bind. What you should know about Titebond III is that is dries a brown colour, and takes a fair while to harden. 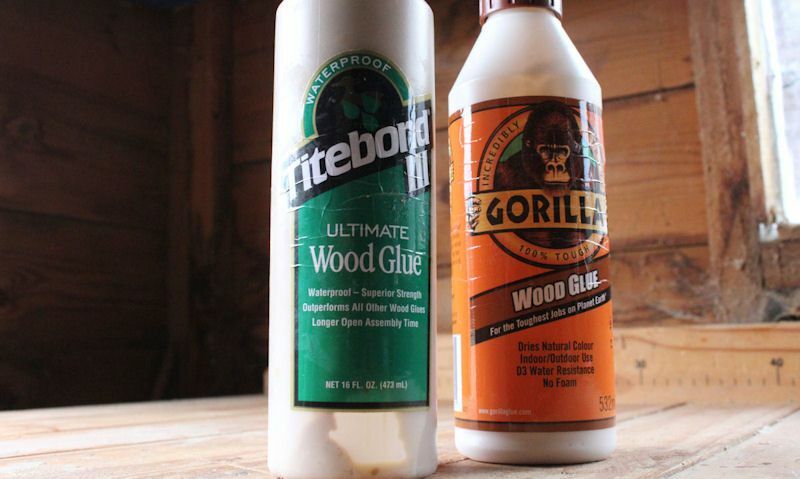 So if visible dry glue is a concern to you then Gorilla glue will be a good alternative, but still Titebond III is a good glue and completely safe when dry. Why stick with a glue brand you know best when there could be better options out, so we gave Gorilla a go with fantastic results - but we still love Titebond III. Gorilla dries up as you would expect - clear - and has a quick drying time so you can get on with your project a little quicker, with less holding by hand or clamping time. Double sided tape should never be used on your final project, for the record everything should be glued down or screwed. But you will need double sided tape to assist you when making cuts, as clamping could - or would - will get in the way of your tools. 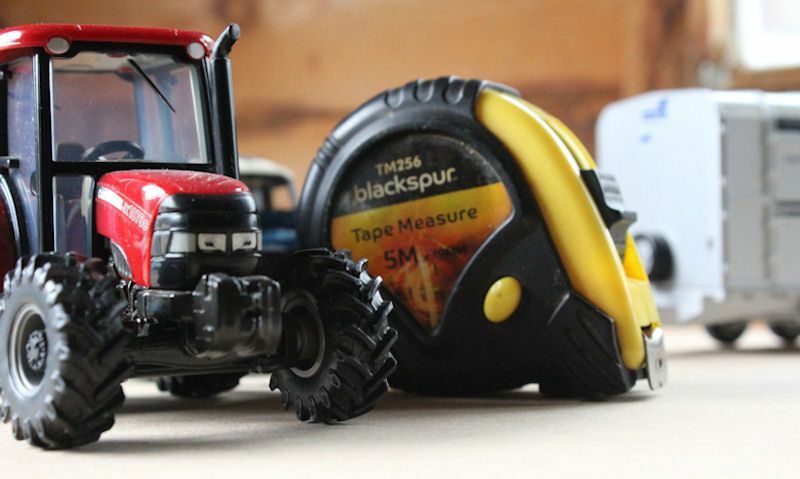 You'll need double sided tape as a temporary solution when creating your farm set, and you'll be surprised just how much it's needed. Absolutely failure when attempting to build our first children's wooden farm set. We failed before we even got started as the whole plan centred around a set built from MDF in 9mm thickness. But the dowels were 6mm and the edges would split every time, and the idea was to make the farm set lighter. There are a few ways you can go about assembling your wooden farm set once you have all your pieces ready for assembly, but we advice to always build your children's wooden farm set using wooden dowels, as nails and screws could be hazardous. You could do it the easy way without dowels by lining up all your parts with glue added to each joining sides, clamping it, let it set, and continue until all parts are glued and joined - but this way is harder then you realise with no dowels keeping parts in place. So what we do it make sure we drill 6mm dowel holes on each part and on the corresponding part it glues to. You should use a drill piece that is a little bigger than 6mm, so you get a little wiggle room during assembly - use 6mm dowels pieces. But we don't necessary glue everything together, because at this stage we are thinking about painting it, and if two parts touch that need painting with two colours, then we'll have to use masking tape or do it be hand to create a straight line - but it looks ugly either way. So the plan is to recognise which parts touch and paint each part before gluing together, but make sure you don't glue the edges that requires the glue, just use enough paint to go around the corners ever so slightly so there's no touch ups later. Well we would prefer to use water based paints, these Plasti-Kote small bottles of paints are much more hard wearing, and I'm sure will come in handy when the time is right. To paint your wooden farm the colour of your choice, recognise what colour these are and pick them out. But allow yourself to change your mind as exact colour matches are not always available. What we would advice is simply look for solid water based colour such as white, grey, black, red and blue (but no limited to these) and mix these colours to produce new colours or make a whole new shade suitable for your project. Once you've finally painted your project, we can't stress enough that you should protect your farm set with a semi-gloss or gloss clear sealer. Not only we you protect the farm set from grubby hands, but protect your home from potential paint marks. A few years ago we would have recommended a child safe paint called Japlac, an enamel paint that takes to wood nicely, but this as since become hard to find in store and to be fair, is quite smelly. Then came along Plasti-Kote - brush or spray - another enamel based paint, and well takes to wood well too, it again is a smelly paint and comes in small jars, and quite an expensive paint to buy. 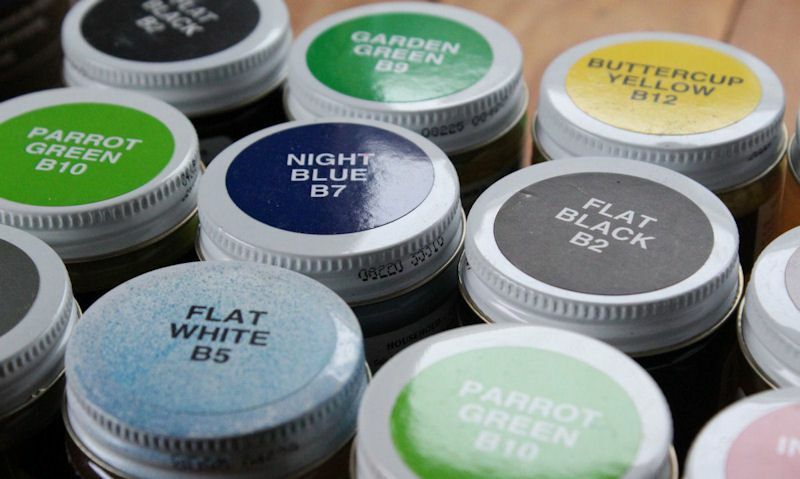 Then we discovered a UK manufacturer and seller of non-toxic paints called Spectral Coatings. This firm sell to both the public and trade water based paints with stains, lacquers and painting accessories also available. If you're working with natural wood and wish to keep that look, protect the unfinished wood either using a combination of dye and wax, or only use wax to protect the surface. If you paint your wooden farm set you can be sure the grain will still come through, and believe us when we say you want this to happen, as the visible grain will really produce a lovely finish through enamel or water based paints. If you're using natural wood like pine and don't wish to paint over the natural grain, it will still be a good idea to protect the wood from marks. 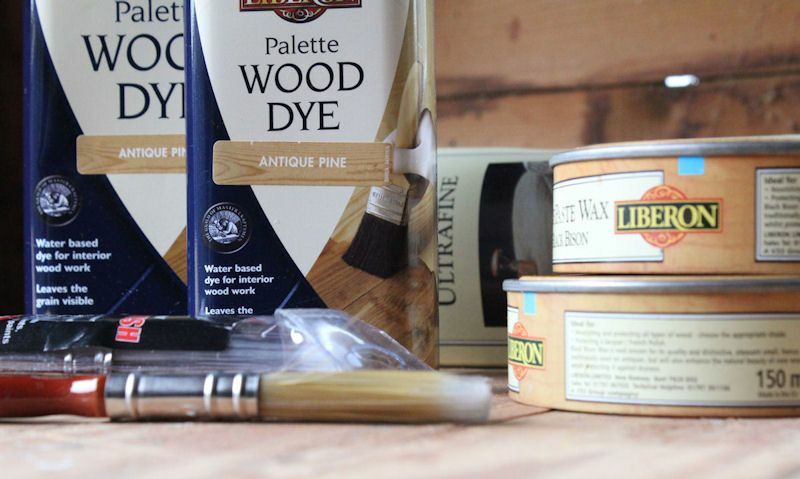 You could use a natural wood dye with colours available like antique pine, but then you could avoid discolouring your project by simply going straight for a clear wax or varnish. And well you apply dyes using a brush, you'll need a wire rag for applying wax.